I was working with a client the other day and he said, “You know – this creative/reactive thing we’ve been talking about. It applies to everything.” I had to smile. He’s right. So many people think leadership at work is like a coat we put on – a set of external behaviors that we use to elicit certain results. When actually, true leadership is an expression of our deepest identity. I read a quote once, “Being a leader is as much about who you are as what you do.” Now what we do is vitally important, but who we’re being is equally so. And who we are affects not only our colleagues but all our important relationships. 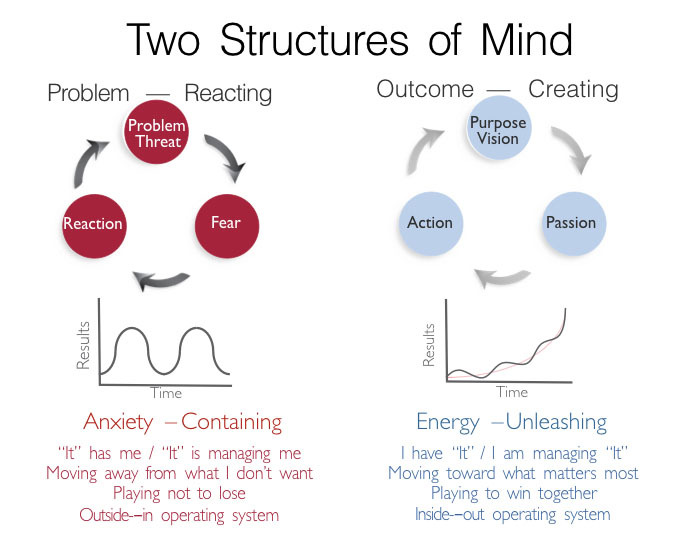 On the left is the Problem – Reacting Mindset that most of us adapt through habit. The problem may go away temporarily and we relax, but then the problem reasserts itself and the cycle continues. Our focus is on containing the threat, which creates anxiety. Think of a salesperson who has sales goals to meet. It’s the end of the quarter, the numbers aren’t there. Fear ensues (no bonus, boss mad). The salesperson bursts into gear and gets some sales. The threat recedes and the cycle continues. The problem with this approach is our effectiveness never improves and we’re constantly avoiding issues. On the right is the Outcome – Creating Mindset that we can adapt with practice. Think of our salesperson. She believes in her product and feels everyone would benefit from having the opportunity to know about this product. She structures her activities around this purpose and achieves success, which unleashes her energy to achieve more. 1. Am I trying to avoid a problem or threat? 2. Am I trying to create an outcome? If you answer, yes to question one, try reframing it by asking yourself, what outcome do I want and what do I need to do to accomplish that outcome.